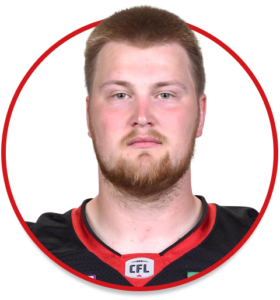 Evan Johnson is an offensive lineman currently playing with the Ottawa REDBLACKS. Drafted by the REDBLACKS in the 1st round, 9th overall, in the 2017 CFL Draft. Signed May 24, 2017. Played in all 18 regular season games and the one playoff game for the REDBLACKS. Named to the 2016 U Sports All-Canadians Second Team and Canada West All-Stars. His senior year (2016) with the Saskatchewan Huskies, Johnson played in all eight games for the Huskies on the offensive line and helped the offence to average 32.6 points per game and 434 yards per game.